Visiting Ucluelet with your Dog - Ucluelet-Info the ultimate vacation guide. Endless beaches, heaps of forest trails and plenty of other outdoor activities make Ucluelet on the west coast of Vancouver Island an ideal place to bring Rover along for the fun. However, there are plenty of things that need to be considered including accommodation, safety and whether or not your dog will be able to join in on ALL of the fun to be had during your vacation. Read on for tips, things to do and things to think about when considering bringing your dog along to Ucluelet. Probably the most important part, you’ll need to find an accommodation provider that allows pets. Whether you’re booking a vacation rental, want to stay in a cabin, or were hoping to stay at a hotel, it’s an important question to ask. Some only allow small dogs, while others allow none at all. Some campgrounds have similar rules, too. If you find a hotel, motel or resort that allows pets, be aware that that likely means there will be multiple dogs around, or the owners themselves may have pets. If your dog is shy, or unfriendly towards other dogs, it might be best to try to track down a private vacation rental instead. Lastly, even if they do allow pets, there may be an extra charge, so be prepared to spend a bit extra by having them there! Ucluelet is known as a wild and rugged location, which means it shares its land with plenty of wild animals. It is important to never leave your pets unattended and to be aware of any recent animal warnings for the area. Dogs should be kept on leashes, especially in the forest. Not only are there bears, but wolves and the occasional cougar have created a cause for caution in the past. It’s also good to know that all trails and beaches in the Pacific Rim National Park require dogs to be on a leash, too! If your dog does get injured, the closest vet clinic is in Port Alberni, as neither Ucluelet, nor Tofino have their own. The winding road between the coast and Port Alberni is about a 1.5 hour drive. If you can’t find accommodation that allows dogs, Ucluelet has a service that will let you have a holiday, while giving your dog one too! Ucluelet Dog Services offers dog day and overnight bording service, walks and even kennels for rent so that you can head off on your own dog-free adventure without worrying! Forget something? Not to worry. Ucluelet is home to a fantastic pet shop, Ocean Pet Supplies, whose owner is an absolute doggy guru. Expect to find some of the best dog products available from treats and food, to shampoos, toys and necessities. The Wild Pacific Trail is easily one of the top things to do in Ucluelet! With 8km of beautifully maintained trail running along the coast, it is incredibly scenic and fun for everyone. The variable terrain and different trail options mean the trail is doable for big dogs, small dogs, young and old! It can be broken into the easy, wheel-chair accessible Lighthouse Loop, or visitors can enjoy the longer Artist Loops and trails out to the Rocky Bluffs. For other hikes your dog will love, check out our hiking page! The two closest beaches to Ucluelet, Florencia Bay and Wickaninnish are a paradise for dogs that love to run on endless sand, play in the waves and explore! Florencia has the option of some great little forest trails, too! For more beach hotspots on the west coast, take a peek at our beaches page. The payoff of Mount Ozzard is huge, and the way to the top is an easy affair! Parking at the yellow gate, a big gravel road takes you up to the top. That means, aside from few and far between dirt bikes, 4×4’s, or work trucks, dogs can roam confidently. It’s an easy path on older dogs and the way up isn’t too strenuous, especially considering the view! It still takes a good hour or so, so if you’re worried it won’t be worth the adventure, it’ll definitely still tucker out the pup. Need more reasons to take on Mount Ozzard? There’s a blog post for that. If your dog likes swimming, but you’re not into the idea of salt and sand, Kennedy Lake is the place to be! Kennedy Lake is the largest body of freshwater on Vancouver Island and has plenty of beaches, provincial park day use areas and spots to just hang out in the sun and enjoy! A short distance away from Ucluelet, it makes for the perfect day trip. Some of the lesser known spots are off away from the road, making it perfect for the dog to explore without a leash. The provincial park spots may require the dog to be leashed at all times. Big Beach and Little Beach are great spots to catch sunset and take the dog for a romp, without having to go very far. The two small beaches are within Ucluelet and are a great hangout spot. Pack a picnic and let the dog roam! Big Beach has access to the Wild Pacific Trail, as well as a picnic area, and both have port-a-potties, too, so you can tucker the dog out by staying all day if you want! For bigger beaches with more sand, head out towards Tofino! Ucluelet has a number of great parks and fields thanks to the elementary and secondary schools. In the middle of the running track and just beyond, the fields are surrounded by open fences and give dogs an expanse of soft grass to run and play on! Just beyond the Petro-Can there’s another great, fenced dog area as well. Bring the Chuck It and expect to be able to spend hours throwing it as far as possible. It’s a great place to meet with other dogs, too, giving them that social, holiday aspect. Use the hose-off stations at the beaches before departure! At the end of the day, Ucluelet and Tofino are two of the most dog-friendly vacation places around. In fact, it’s so encouraged to bring your fur baby along that some places even have pet towels and extra amenities just for your dog. With so much fun to be had, it’s only natural you’ll want to bring your other half along for the ride. 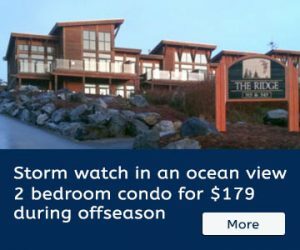 Ten Reasons to Visit Ucluelet in the Winter Whale Watching in Ucluelet, B.C.